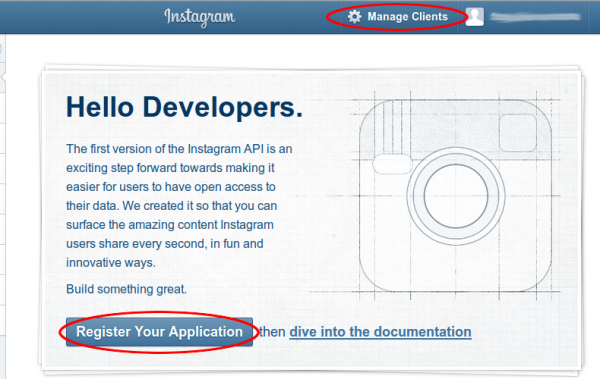 To do this you need to Register an Application for your website with Instagram. Visit the link below and sign in with your normal Instagram login. If this is your first time here then clicking the Register Your Application button will take you to a quick form asking what your intend on doing with the API. Fill out the fields, tick the terms and conditions and then “Sign Up”. Click the Register your Application or Manage Clients button, they will both take you to the same place. OAuth redirect_uri, This is your websites URL including the path to Magento (if in a subfolder) with “index.php/instagram/auth/” added at the end. 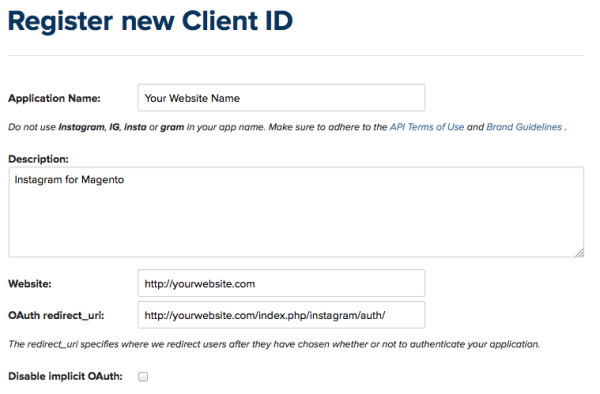 This is the return URL that the Instagram for Magento extension needs to verify your Client ID and talk with the Instagram API. Once you have those filled out, fill in the Captcha then click the Register button. You will now be given a Client ID and a Client Secret, you will need these for your store so keep them handy. 1) upload the contents of the two folders (app and skin) to the corresponding directories in your store via FTP. 2) Via the admin area of your store, use the Connect Manager (System -> Magento Connect -> Magento Connect Manager) to install the package (CDL_Instagram-1.2.1.tgz). Clear the cache (System -> Cache Management) then log out of the admin area, then log back in. You will now have a new tab in your System -> Configuration panel called CDL with a tab named Instagram Gallery. 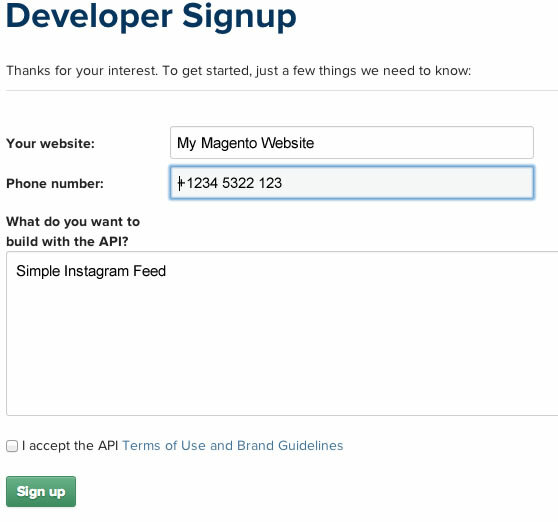 Now we connect Magento with Instagram, enter your Client ID and Client Secret into the fields in the Magento System Configuration Instagram Gallery tab. Save the config. 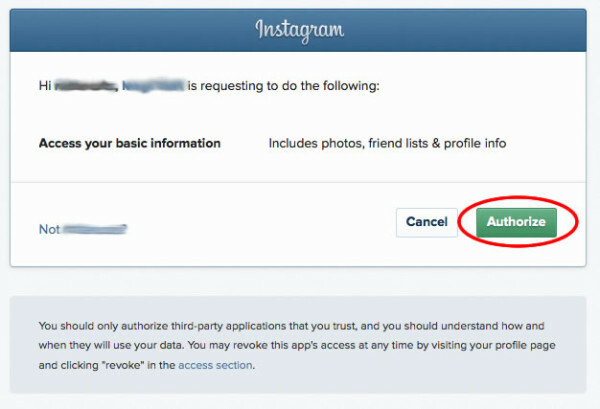 Now you can authorise your website with Instagram by using the Auth on Instagram Button. If you see a white page with some weird code in it instead of the Instagram website then you have not entered the correct Client ID and Client Secret and saved the config. Go back and double check these numbers with the ones given to you here, http://instagram.com/developer#. If you have successfully Authorised Instagram and Magento together then you should see your Instagram Username and Profile Pic in the Magento CDL Instagram Admin section. If you do not see your profile pic but everything went well, clear the cache (System -> Cache Management). If you still do not see your pic, the authorisation process did not work, please go through it again.